I'm not normally very interested in quines, but today I saw one that that really made me sit down and study it carefully. 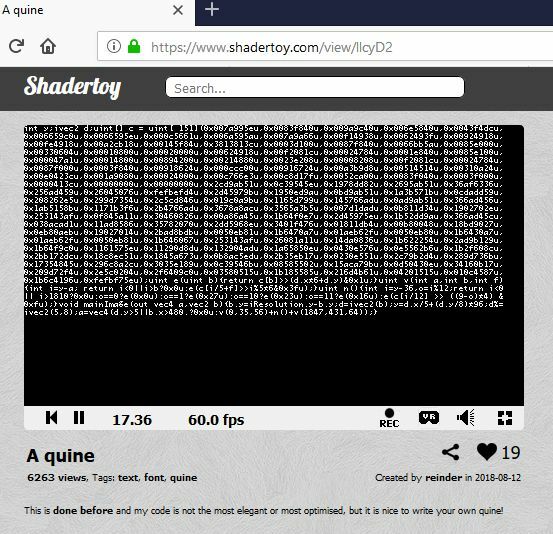 It was a quine in the form of a shadertoy. For those that might be wondering, the impressive thing about this is that GLSL doesn't really have a concept of text, or fonts, or anything that could be used to put human-readable messages on the screen. The output of a pixel shader is just a color, and that's it. So how does this thing manage to display its own source code and be so compact? That's what I set out to learn.